Amazon’s Black Friday Starts Now! Black Friday at Amazon has officially started…all of that other stuff was just a warm-up. To check out all of the deals, you can click here or type in http://smarturl.it/amazonbfriday into your web browser. The deals will change every hour – sometimes they are for maybe an hour or two, others will last all day. If you trade in an old Kindle – working or not – you can get 25% off a new Kindle e-Reader. A Fire HD 10 has been discounted $50 and is only $99.99 – grab this one while you can! The list of things on sale changes every five minutes, and you may need to click the “refresh” button on your browser – this is the time I do a lot of Christmas shopping. I will tell you I saw the DeWalt battery-operated power tools at 35% off…. To check out all of the deals, you can click here or type in http://smarturl.it/amazonbfriday into your web browser but remember – the deals will change frequently during the day! It’s time for another rambling blog post, where I sit down to the keyboard with not too much of a set agenda…..this one is short and sweet! Amazon has announced a brand new version of the Kindle Paperwhite, with a release date of November 7th. You can check it out if you click here or type in http://geni.us/pwhite into your web browser. I’ve always maintained the Paperwhite is the best eReader out there when you look at the features, feel of it in your hand, ease of reading, and, most important, the cost. This new version comes with more memory than previous versions, is the thinnest version yet (now thinner than the Oasis), and comes with Bluetooth so you can listen to music or audiobooks, and is waterproof. Unlike prior years when I bought every new version of the Kindle that came out, I won’t be purchasing this one. Why? Mine works just fine! They last a long time and are very durable, and I can use that money for something else. If mine does bite the dust or I break or lose it while on an out of town trip (that has happened to me), I will go for a new Paperwhite. On the other hand, let’s say you have an older Kindle that is collecting dust, isn’t working very well or is broken, or you need an upgrade: Amazon will buy your old Kindle and give you a 25% off voucher for purchasing a new Kindle. Who knows what they will give you for the old Kindle, but if you do trade it in that means the new version of the Paperwhite would cost you less than $100. That would be a heck of a deal. If you want to know more about the trade-in program, you can click here or type in http://geni.us/tradein into your web browser and read all about it. I am asked many times what to do with a Kindle that still works yet is not being used – not a junker but one that works – are there any charities I am aware of that can use them? Absolutely! One of the best I know of is called the Kindle Classroom Project (donatekindle.com). The Kindle Classroom Project issues Kindles to high school students in the Oakland / San Francisco, CA area of the United States and just last month celebrated issuing 2,000 Kindles. I’ve donated a few to them over the years and many of our readers have, also. Rather than letting a good Kindle collect dust or be toxic in a landfill, why not give the gift of reading? A little over a week ago, I had a long post about how to organize your books into collections on an e-Ink Kindle. I’ve had a few requests of “where is that post again” or “how do you” so here it is again: just click here or type in http://smarturl.it/100718 into your web browser. That’s all I had for today – have a great rest of your week! With what seems to be an annual occurrence, Amazon has announced a new Fire HD 8 Tablet for $79.99 and a new Fire HD 8 Kids Edition for $129.99. The Kids Edition is priced higher because it comes with a very sturdy case to protect it from drops and, with 32GB of memory, the Kids Edition is double the memory for the base unit; you can double the memory of the “regular” Fire HD 8 Tablet for an additional $30. For the first time, I won’t be ordering one of the new model tablets – this one, or even if they come out with a new HD 10 (the main tablet I use when using a tablet). Why? Mine, as well as the prior year model’s I haven’t given away to a charity, still work just fine. I do consider myself a gadget guy and have rushed out to get the latest and greatest to check them out to see what they can do, but the last two upgrades in the larger tablets, to me, haven’t been worth the money spent to upgrade. If your tablet is working fine, I would recommend you keep on using it until it breaks. The announcement of a new Fire Tablet did not have a simultaneous announcement of a new Kindle e-Reader. There have been a few tweaks to existing models over the past few years, and the last major “new” Kindle I can recall was the introduction of the Kindle Oasis a couple of years ago. If a new or tweaked model is announced this year I won’t be buying one of those, either. The ones I have still work just fine and should last me for several more years. For reading books, I still use a Kindle vs. a Fire tablet mainly because of battery life: the tablets drain the battery pretty fast for me, and I don’t want to have to stop what I’m reading just to charge the thing back up. I use the tablet to check my personal email when on the road or during my lunch break at work, and I do play the random games at night just to unwind before I start reading. What Kindle do I use to read? I’ve been using the Kindle Oasis quite a bit because it has a slightly larger screen, but the main reason is because it has a higher capacity battery and 3G connectivity vs. just a WiFi connection. I travel quite a bit for both work and play, and sitting for a while either in a hotel or plane I want to not have to worry about finding an outlet or connection. I’ve also been reading a lot with my old Kindle DX – that was the one Amazon used to make that has a “ginormous” screen. I’ve been out to a local lake a lot this summer, and for some reason have been pulling that one out to read while outside. It has been having battery issues and not holding a charge longer than two days, so I recently replaced the battery and it is acting like new again. Yes, you can replace the batteries on your Kindles and Fire tablets! It’s also a lot cheaper than buying a new device and going through the time-consuming process of transferring your old device’s contents to a new device. Amazon used to have a lot of third-party sellers selling replacement batteries on their site but these have for the most part disappeared. I got mine from www.newpower99.com; I have no affiliation with them, but I will tell you in addition to a replacement battery the kit came with the tools to do the job plus a very informative video hosted on YouTube that walked through the process. With shipping, it was $35: considering the Kindle DX cost $499 back in the day and still does a great job, that seemed like a good deal to me. Anyway, back to Kindle e-Readers…..while I use the Oasis a lot, I recognize at $279.99 for the basic model that is very expensive. I’m asked all of the time by friends, family, and people here on fkbt.com what Kindle e-Reader I would recommend to purchase. To me, the best price and value for your money is the Kindle Paperwhite. At $119.99 for the base model, you get a backlight display and a reader with fonts that are very crisp plus the battery lasts a long time. The covers available to the Paperwhite are also a lot more sturdy and protective than the ones available for the Oasis. While that’s my opinion, take it for what it’s worth as your experience may differ! That’s about all I had for today. If you’ve read this far, thanks! If you have a friend who likes to read a lot, have you told them about this site? Just tell them to go to www.fkbt.com and check it out, and be sure to sign up for the daily digest email of the free and discounted Kindle book offers (for free, of course)! Why do I write reviews? Well, I do read what others write for reviews, and those reviews do influence my decision to (a) first try out the free Kindle sample, which a lot of the time leads me to (b) purchasing a book. I appreciate the time and effort complete strangers took to write a review to tell me the good and the bad, and common courtesy tells me I should do the same. If I like a book I’ll tell you – if I didn’t like it, well, let’s just say I’ve been told my professional career has been limited a time or two for being too honest (i.e., blunt). I also look to see if a review on the Amazon website is from an “Amazon Verified Purchase,” which tells me the person writing the review actually purchased the item from Amazon; I don’t think people should be able to review books on Amazon unless they purchased it. Why do I look for an Amazon Verified Purchase? I’ve been burned too many times by friends and family of the author or shill reviews – reviewers that immediately rate everything a five star, they leave about one sentence of commentary (the minimum for an Amazon review is something like 20 characters of text), and they are generally marked by it being the one and only review a person has ever written on the Amazon website; these are typically reviews done in order to inflate a book’s overall rating. Another good indicator is a book will have a flurry of reviews around the same day, are short and all five stars, etc. With the thousands of books I have previewed prior to telling you about on www.fkbt.com over the years, I’ve learned to spot the friends and family reviews pretty quick. As far as the reviews I write, I try to write an honest assessment if I liked something or not without providing a spoiler: why write a spoiler and ruin it for everyone? I also think your and my taste regarding the likes and dislikes of a particular book are more honest than a paid book reviewer a major publishing house contracts with to have in a book’s advertising materials. My motto is to keep it short and sweet on your likes and dislikes without providing a Cliff’s Notes version of the book. Some people think I shouldn’t be writing reviews because I have this blog, and due to the blog’s popularity it could influence people’s behavior, especially if I “give” it a bad rating – every once in a while I will have a rather interesting dialogue with a few folks regarding the same. My response to those type of comments is my – and anyone else’s – review of a book reflects my opinion only and I don’t “give” out anything: your opinion on a book or item may vary, and we probably won’t agree on everything. For example, something I really liked you may absolutely detest and puke all over it. The same could be true for something you thought was outstanding and I may question why it was published in the first place. When I read reviews sure, the star rating is important (see above), but I don’t put that much weight into the “star” rating as I look at the comments – mainly to see if they are substantive to back up the rating as well as to see what the reviewer’s pluses and minuses are with the book. If you look at those written comments, sometimes they match up to the “star” rating and sometime they do not. I also discount reviewers who rate everything a 5 star and I imagine most others do, too. If you would like to read the reviews I have written, you can click here or type in http://smarturl.it/mgreviews into your web browser. As I type this post, I have quite a few books I need to review but you will see just about everything I’ve read over the last ten years – you’ll see I do read a lot of the free book offers, and long time readers of the blog will also see I have continued my science fiction kick. You can vote on the individual reviews on the Amazon website if you think they were helpful or not with a simple “Yes” or “No” vote – you can click on those voting options immediately below the text of each review. The more “Yes” votes you get in proportion to the overall votes – as well as some super-secret factors Amazon won’t divulge – you will move up in the review ranking scale (yes, Amazon ranks the reviewers). Compared to prior years, I’ve dropped down in the rankings: I’ve kept pretty steady with the numer of reviews I’ve written but clearly more people have more time on their hands than I do! So, yes, I will continue writing reviews and I hope you will do the same! December Informal Poll: What Are YOU Reading on Your Kindle? For several years, I started or participated in a monthly poll on the USA Amazon Kindle discussion boards asking people a simple question: what are you reading on your Kindle? I stopped doing it on the Amazon discussion boards and started hosting it periodically on the blog’s website (on a side note, Amazon stopped the discussion boards a few months ago). I’ve received some great tips with past polls, finding out what others are reading on their Kindle, and found some “new” authors I generally wouldn’t have found using my hunt-and-peck method. While I have certainly enjoyed the mainstream author suggestions over the years, I’ve also enjoyed a lot of independent authors from each month’s poll I never would have heard of previously. If you are reading this on your e-Ink Kindle or the blog’s free email subscription – or anywhere other than the blog’s website – and would like to check out the poll and find some new things or, better yet, tell others what you are reading, just click here or type in http://smarturl.it/1217poll into your web browser, scroll down to the bottom of the post, and start typing away in the comments section! 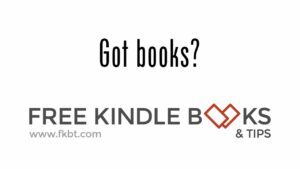 Here’s how this works – on the blog’s website (using the link above) list a book you are currently reading or just recently read on your Kindle, whether you would recommend it, did you get it free, and anything else you would care to share. Like many in Texas, I have been sequestered for about a week now with the flu – in between napping and feeling miserable I have had a chance to read quite a bit. I literally just started Hidden Figures: The American Dream and the Untold Story of the Black Women Mathematicians Who Helped Win the Space Race (you can type in http://geni.us/hiddenfigures into your web browser to see it). I watched the movie several months ago with my family and thought it was outstanding; Amazon had the Kindle version of the book discounted to $2.99 (from $9.99) on Thursday, so I grabbed it and am looking forward to it. I also read four thrillers by Roger Stelljes this month: they were very good and hard to put down. If you are looking to start a new series of engaging thrillers, I would recommend you give his Mac McRyan series a try. Start off with The St. Paul Conspiracy (you can type in http://geni.us/stpaul into your web browser to see it), then progress up through the series. As soon as I finish the Hidden Figures book mentioned above, I will be starting book five of this series (ironically, as I type up this post, it is free in the Kindle store). Finally, here’s my standard continuation of each request for prior participants in the poll: if you like or dislike a title you have read, in addition to telling us about it in this informal poll, how about writing a book review on the Amazon website? The review will certainly last and be visible a lot longer than this poll will. If you’re like me, you look at the customer reviews in order to see if you want to investigate a book further. Since we are all a little community here, and while I realize each review is each person’s opinion and we may not like the same thing, I know your friends and online discussion neighbors would appreciate your honest assessment of the likes and dislikes without providing a spoiler – I know I would! Your reviews don’t need to be a long dissertation of the book, I like to keep them short, sweet, and hopefully to the point (some people think I am too blunt on things I dislike, but I am at least giving you my honest opinion!). We’d really like to hear what you’re reading right now – I, for example, may find something interesting from your list I want to read (It’s been known to happen!). If you are reading this on your Kindle – or anywhere other than the blog’s website – and would like to check out the poll and find some new things or, better yet, tell others what you are reading, just click here or type in http://smarturl.it/1217poll into your web browser, scroll down to the bottom of the post, and start typing away in the comments section! Anyway, that’s all for this one: have a great rest of 2017! A Kindle Paperwhite is discounted $30 to just $89.99 – if you are unfamiliar with the Paperwhite, I think it is the best value Kindle there is and I use mine all of the time. Seeing as how these are discounted to under $100, this one to me is a steal. Kindles and Fires Significantly Discounted! If you are thinking about getting a new Fire Tablet or Kindle e-Reader such as a Paperwhite, Amazon is running a deal right now as an early Black Friday event – $50 off a Fire HD 10 tablet and $30 off a Kindle Paperwhite: this makes both of them a heck of a deal and under $100. I don’t know how long the deal will last, but if you are interested you can click here or type in http://smarturl.it/amazonbfriday into your web browser. This link is good for the USA, UK, and Canada. You can also use that link to shop all of the pre-Black Friday deals as well as on Black Friday for the expected full blowout we have come to expect from Amazon. On the other hand, you can also still signup for our giveaway where someone will win a new Fire HD 10 tablet, Kindle Paperwhite, and one of over half a dozen other items. Have you signed up? You can (and it’s free to enter) if you click here or type in http://geni.us/1117giveaway into your web browser. Free Kindle book offers coming in the next post! Here is my Hurricane Harvey update from my previous post: we evacuated the day before the storm hit about 100 miles north of Houston. It took a while to make it back home as most of the Interstates into the city were flooded (in addition to everything else). I-45 finally cleared most of the way home and we made it back to Houston Wednesday afternoon – we had about two feet of water in the garage yet none in the house as it was built elevated from the street level. Sure, we threw away a lot of ruined stuff but our cleanup is done, it was only material things, and we feel extremely lucky. Over 40 people at my company’s Houston offices need a new place to live: the devastation across the city you saw on the national news was about 10% of reality – it is really bad. Many neighborhoods are still underwater and over 100,000 people lost everything. Today is Labor Day in the United States: if you are in the Houston area, please consider donating some of your sweat equity to a neighbor, friend, or total stranger to assist in the cleanup efforts – they need the help! If you are not in the Houston area, please consider a donation to any charity assisting the Houston recovery efforts with the exception of the Red Cross (they take out way too much of your donation as an overhead administrative fee): many local churches are involved and I would recommend hitting the link at www.second.org as they have boots on the ground across the Houston area right now making a huge difference, and 100% of the donation goes to helping out those who lost everything. Texans don’t complain about what the government didn’t do for them, but roll up their sleeves and get it done!